She Art Product Sale and NEW video! Happy Monday friends! IT TRULY is a happy monday! I am heading to the airport to catch my flight for the long 16 hour fight to Sweden.. to teach at the awesome event there! So happy to Petra for bringing me out! I can't wait!! This project was so simple because I used the die-cuts from the She Art line..
ONE thing you should know.. is that i found out today.. that Pink Paislee has officially SOLD OUT of all of the She Art products from my Winter Release.. so doodle rubons, texture rubons, die-cuts, tissue paper, doily mask, and paper pads! Which means.. WHAT WE HAVE IN THE STORE.. is ALL we have in the store! once it's gone it's gone! seriously.. so sad? I had to hoard about 15 doodle rubons just for myself because I use them on just about EVERYTHING i make! EEK!! (seriously gonna have to talk to them about making more of these.. WE NEED these all year long? lol.. we use them over and over and over! lol) Right? who's with me? anyhow.. SO TODAY and tomorrow we are having a big sale on those products in the Christy Tomlinson Design Section! on check out and you will receive 20% off everyting in my lines. PLUS guess what? we just added new stamps, new sprays, new paper pads, you name it.. we added it. PLUS restock all ranger, crafters workshop.. etc. So the store is PACKED FULL! so take advantage of today's sale! Okay. enough talk! Here is a Behind the Art video showing you how to use all of these SUPER fun products! oh and watch for a blog post from me on wednesday! I will be showing you sneak peek no. 4 of the living canvas workshop And anoucning A huge GIVEAWAY we are doing in conjunction with the workshop! You won't want to miss it!! HUGE giveaway! Roberts Jones and My valentines day makeover video! Okay!! Soo.. if you remember THIS post here (linked for you lol) I had the opportunity spend the day being pampered and "made over" by the awesome and talented makeup artist and teacher.. Robert Jones! Robert is a world re-nowned makeup artist who has done work for Selena Gomez, Cindy Crawford and many many other people in the entrainment industry! He has several books that are published and travels all over the world teaching his art of makeup. Robert ALSO teaches online classes.. just like I do.. on how to apply makeup for the everyday, for weddings, for pictures.. what brushes to use, what colors to use for the color of eyes you have, what shades to wear to make your eyes pop.. or your features stand out. He really knows his stuff. SO if you are ever interested in learning about his workshops.. THEY are wonderful! and all online! And of course he said I could give my customers a deal.. normally a membership to the site to watch the videos is $24.95.. but for you friend.. its only $19.95 if you use THIS Link to sign up. You can sign up for one month or as many months as you want. Tons of fun videos to watch! AND...If you know me. I LOVE all forms of art and truly appreciate them in all their forms! AND i have to admit i have a thing for makeup. I always have.. since i was young.. because my mom was a mary kay consultant.. so was fascinated early on in life.. on how to properly apply it.. how to hide imperfections in my skin Etc. ANd Still am today. I LOVE learning ways to shade the face or highlight the eyes or how to do a smokey eye.. or a natural sun-kissed look. Its fun for me to learn those and apply them. SO when I was asked to do this with Robert.. I was like HECK YA!!?? to learn from the best? So Robert flew into little old idaho.. from his studio in Texas.. and spend the entire day doing my hair, makeup.. and of course giving me a new outfit to wear. (which I was nervous to wear because I wanted the size bigger to hide my curves.. and he said.. um no lol) . but it turned out great! Bart Miller and his team.. and the girls from Paisley Studio.. where all there to help document it. We did it all at theAustin Kade Academny here in Idaho Falls.. which is owned by my now dear friend Allison Price. (I met her that day and she is the one who colored my hair... and we were INSTANT friends.. LOVE THIS GIRL) . I think we had this instant connection because she is ALSO a teacher.. she teaches the art of hair. anyhow.. the entire day was wonderful and it ended with my family coming to the studio to see my big reveal..
and THAT was fun too. The entire day was fun! oh and I really shouldn't post this.. because my before is really awful.. no makeup.. not hair done.. but the after.. is awesome. The AFTER is amazing!!! wish I looked like that everday in real life! lol anyhow.. ENOUGH talk and rambling!! HERE IS the entire video showing the day and all the fun stuff!!! hope you enjoy!! Christy Tomlinson Blog Post Video from Robert Jones Beauty Academy on Vimeo. But now it's done!! and I LOVE how this month's kit turned out! I did a set of three canvases.. that are designed to sit on a shelf or a wall together.. 6x6 in size.. I wanted a super soft palette for this, so kept in the blue , cream and wood tones. Seriously love how it turned out..
anyhow! turned out super fun! AND YES we do have more of these LISTED in our Shop! check it out.. Anyhow! I hope you have a SUPER fabulous Day! It's Thursday! :) wahoo! Here is the Video! ENJOY! Happy Monday.. and sneak peek of week 3! (my goofballs below playing around in my dad's old airport bus he used to take them to movies in)..
and playing cards and having a BBQ this weekend with my brothers and sisters who were in town! lots of fun memories made last week. so I guess I better get cracking..
AND since today is monday.. as you know we have been showing a sneak peek each week of my upcoming workshop, Your Living Canvas. This week is week 3.. Vision! Alot of us.. INCLUDING me.. have a tag line or a motto that we "refer to" or live by.. Mine is on my blog header.. DO what matters most. While this is a great START to having a vision.. a vision is much more than that. A vision is a statement or words or paragraphs of what we call our "non-negotiables" in life. In the way we live our life, in what we want out of it, in how we are with others, in our beliefs.. in our souls. I have many "non-negotiables".. some of them include the following..
my family comes first.. in everything. these are a few others.. always always treat others with kindness.. and give the benefit of the doubt. Be okay with YOU and love your imperfections.. beauty is NOT whats on the outside..
these are just a few of them.. I will share many many more of my own in the workshop.. but this the vision statement I have for my life and to be honest as I learn and grow and change and have new experiences.. things are added to my vision statement.. my non negotiables and sometime they change. Which is okay.. but I make sure that when I live my day to day life and are faced with making decision, i refer back to that mission statement to go to. Okay.. so I don't always REFER to it first. I have moments of weakness.. lots of them.. when i make poor decisions and vere of the path.. but then mend the mistake and hop right back on that vision and move forward. So with that being said.. week 3 is all about creating a vision statement. Finding and listing out your non-negoationables.. and then putting them into an art journal and canvas to refer back to again and again.. and make changes if needs be! And we will help you do that! So here is a sneak peek VIDEO of week 3!! For more info on this workshop starting in May.. you can check this link here! Finding Balance... week 2 sneak peek of the Living Canvas Workshop! Okay so if you know me well.. I DO not balance my life well. I actually have really good balance when it comes to standing on my head, doing yoga poses (i don't actually do yoga, but it's fun to see if you can do the poses and think you are cool because you can. lol).. anyhow totally off track. HOWEVER one of the things I learned when working with Art.. was to FIND balance.. and what that means for ME. ANd why it's important and WHY it is good for me and for life and how actually when I have balance in my life i am so much more productive and happy and present. so what does this all have to do with anything? Well as I mentioned LAST week on THIS BLOG POST.. i am debuting each month for the next five weeks.. a sneak peek of each of the weeks of my upcoming workshop: Your living Canvas.. with my friendArt McCracken. Week 2 is all about.. you guessed it.. Balance and the Six F's. I will let the video tell you more about that and what it has meant for me. Again.. I am seriously so passionate about this workshop! I SURE hope you join me in it!! Behind the Art.. She Art girl..
People kept asking us what we plans we had for California.. and honestly we had NONE. each day we would wake up and say.. okay what sounds fun today? The kids mainly loved playing in the pool and then we spent a day at the beach. But all in all it was just some serious laid back family bonding time! AND speaking of workshops! I need to announce the winners of the 5 people who won access to my newest workshop.. Your Living Canvas! Totally spaced all of that from last week! AND also we have already started the pre-course facebook group page for those of you who have signed up! Remember that you have access to that right now! :) yeah! PLUS you still have the Payment Option plan to pay in two equal payments.. you can read all about it HERE. ALSO A HUGE Question I KEEP GETTING asked about this course.. IS THERE ART INSTRUCTION AND PROJECTS INCLUDED IN THIS COURSE? the asnwer is YES!!!! Of course!!! lol.. So the winners for this class ARE..
Congrats Ladies! Email me and if you have already paid.. email me and I will do a refund for your payment! Sneak Peek for week one.. This week marks exactly 6 weeks to the start of my new online class for 2012.. Your Living Canvas. It's also my biggest class to date (6 weeks!!!) and my most meaningful class yet. Althought the class is 6 weeks.. it includes a FULL YEAR ACCESS TO THE WORKSHOP! So even if you can't start right when we are.. you have a FULL year to work on it! But more importantly it includes life lessons about Creating a Living Canvas. one that you are proud of and one that speaks to you. How to have balance in your life and simplify.. and BE present with those you are with. It also helps you find passion and purpose in your life and living a life (creating a canvas) you can be proud of. This course is very personal to me because I have actually done the exercises myself and it changed my life. It changed the way I looked at life and appreciated what I have and help me feel passionate about what I want to do. Doing what matters most. Anyhow.. So I really wanted to give you a feel for what this class is all about. So each week for the next 6 weeks I will post a sneak peek video of the 6 different weeks of the course. ALSO remember that this course is currently $20 off until April 15th.. and then goes up to the regular price after that.. so now is a GREAT time to get signed up! ALSO for those of you that sign up early.. we have started a facebook group page (if you have already signed up.. you will receive an email on wednesday with info on how to join).. and each Art and I will be posting pre-course challenges to get you ready for the course. some will be simple journaling exercises.. and some will be art exercises.. its going to be fun! We really want you to get the most out of this class!! ALSO so many of you have asked about an Payment Plan option.. to break down the payments into two equal parts.. and we listened and so here you go!! Simply use the option below to sign up for that option. . This option is ONLY available until April 20th.. as the class must be paid in full before the class starts May 21st. For that optoin click on the link Below! So enough talk.. here is a sneak peek of week one: Your story..
ALSO remember if you haven't seen the "Main" sneak peek video.. you can watch that HERE and also read all about the course and each week HERE..
Last week Ben and I headed to Sunny California for a work trip and i have to say.. i didn't even mind that we were inside working from 6 am until 9 pm at night.. it was still so nice to wake up to warm! The last day of our trip we drove down to Newport Beach and soaked in the sun and just literally hung out at the beach all day until our flight left that night. Didn't even have our swimsuits.. just hung out and watched the waves in our jeans and shorts. The sun felt SOO good!! We got home late monday night and have been spending the week playing catchup (I left my laptop on the counter at home.. so came home to over 900 emails.. but honestly with the schedule we were working in California, don't think I would have been able to even stay on top of them.. we were exhausted at the end of each DAY and my eyes closed the minute I hit the pillow each night). I can't wait to tell you about WHAT we were doing in California.. but I am SWORN to secrecy for another few months.. but when I can.. you BET I will be shouting it from the rooftops!! can't wait!! lol.. seriously fun and amazing experience! But so glad to be home again.. missed my kids! This week Ben, Art and I have been filming some short sneak peek videos for my upcoming class Your Living Canvas.. 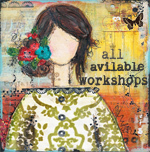 If you read my last blog post, you know this workshop is a HUGE workshop for me! 6 weeks!! And it's probably one of the most meaningful and soul searching workshops I have ever done. I mean I KNOW It is. Is so dear to my heart! So I really wanted to give every one a taste of whats in store for it.. so starting next tuesday I will be posting on one sneak peek a week.. one for each week of the workshop.. of what's in store! I am super excited about it. AND Art and I were talking all this week about how we REALLY want to get people started now.. preparing for the workshop because it is so deep and meaningful.. and we want to make sure everyone come prepared for it.. we started a private facebook group for those who have already joined and starting next wednesday we will be posting pre-course challenges and fun art exercises to get you ready and prepared for the course! So as soon as you sign up for the workshop, you will be invited to that group and can start in the fun! I have never put so much thought and detail into a workshop before.. but I want this course to be everything it can be! Full of life changing experiences, Moments of clarity.. new art techniques you learn, and fun messy play.. all into one. AHH! super excited about this course!! if you want to learn more about it.. you can read last week's post.. OR click here!Wednesday is when the facebook group page starts! AND remember if you sign up before April 15th.. you receive $20 off the original price! Okay.. SO speaking of classes.. there are TWO must do classes you need to sign up for this spring.. (besides joining me in the Living Canvas workshop).. If you have ever taken any of Margie Romney-Alsett's Spark Courses before (she did a Spark your Christmas and Spark your Valentines class).. you KNOW they are full of amazing glittery, vintage fun projects to make for your home for the holidays. Well she has another class out.. called Spark your Spring!! This class is FULL of awesome goodness for Spring Fun! I'm loving her branch with the doily flowers on it! So freaking cute!!! It's a 3 day workshop filled with home decor, papercrafts, gift ideas, kids crafts..even altered clothing ideas! Crazy! and it's $19.00 bucks! seriously! You have to check Spark your Spring out..
Building a Creativley Made Bussiness. If you are a creative person (which I KNOW You all are) and have been wondering how to take your creative dreams and make them into something that you can do for a living as well.. SHE can show you how. This course is all about taking those artsy endeavors and turning them into something more! ANd doing it with Balance and grace. THIS COURSE IS TRULY going to be a great course to take!! I know so many of you email me and ask me what to do with your canvases, or how to do an etsy store.. etc.. this is the course for you!! YOU NEED To take it!! If you want to learn more about this course.. Jeanne has done a sneak peek video of this course too!! So there you go.. two actually THREE awesome classes for Spring.. totally different and all absolutely worth your time!! Oh and one more thing.. that I think would be TOTALLy worth your time.. my friend Art (who is doing the Living Canvas workshop with me) posted this challenge this week.. on his facebook page.. and I SERIOUSLY am taking it.. I won't spoil what it is..but i encourse each of you to do it too! I have done this before a long time ago and remember how it affected my life. I have a huge need to do it again.. and so this weekend plan on writing one..
You will understand more when you watch the the video!! So.. you are going to think I am crazy.. but we are headed out of town AGAIN.. this time with our kids! Last week was our spring break and since ben and I had to be in California for work.. we decided to pull our kids out of school for a few days and head to someplace warm (since we woke up to SNOW this morning?? Hello and happy easter??) We haven't told them yet.. it's been hard keeping a secret all week.. but today at noon we are heading to school to grab them all for a fun family road trip back to California.. just sitting on the beach, swimming in the ocean (or the pool).. nothing fancy.. just some seriously needed family bonding time. These last few months have been a bit crazy for our family.. really crazy and we have just felt the need to give some major attention to our kids.. let them know how much they mean to us and they are important to us.. Part of my new resolution of being PRESENT and having BALANCE (which you will learn about in the New Living Canvas workshop). So once again we are headed out of town.. for a few days.. AND guess what? THIS time I am leaving my laptop at home on PURPOSE. no work will be done on this trip!! I'm going to make sure my kids know it is ALL about them! Im truly going to be PRESENT. But I will be back here tuesday (or wednesday.. you never know with me lol) to show you another sneak peek of this workshop!!) and next week I also have a fun Behind the Art post for you as well. OH HEY!! one more thing! so many of you wanted the exclusive SHe ARt Faber Castell Pen Setsthat we offered a couple of weeks ago that match my New She Art Line with Pink Paislee..
they sold out super fast.. but guess what? THEY ARE BACK IN STOCK!! yeah!! and we have also brought back in stock KasierCrafts Doily Rubons and a bunch more of my favorite KasierCraft Rubons! So check out the Scarlet Lime Shop for that!